Andre of Astora is a Character in Dark Souls. He is located in the basement of the old church, a disused building that connects the Undead Parish with the Darkroot Garden. He will repair and upgrade your weapons and armor for a fee of souls and materials. He can also ascend certain weaponry if given the proper ember. 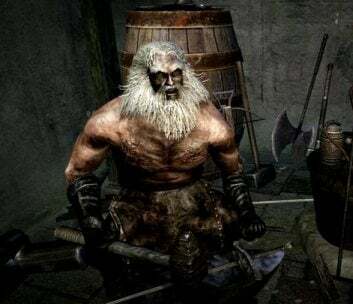 He also sells Titanite Shards, Smithing Boxes for weapons and armor, a Repairbox for use at bonfires, and assorted weaponry. The crest of Artorias can be purchased here for 20,000 souls.